E3, SmartGlass, and the future of how humans interface with machines. The Electronic Entertainment Expo, or more widely known as E3, is a video games conference based out of LA. Ok, Ok, Ok, it is THE video games conference. It’s an event some wait all year for. It’s where publishers, hardware producers, and smaller indy development houses all converge at the LA Convention Center for what is a huge industry event. The event is so large that it has ramifications for the tech industry at large. Case in point – Microsoft’s latest coolness: SmartGlass. SmartGlass from Microsoft binds all your devices to the XBox360, making it overlord of your living room. 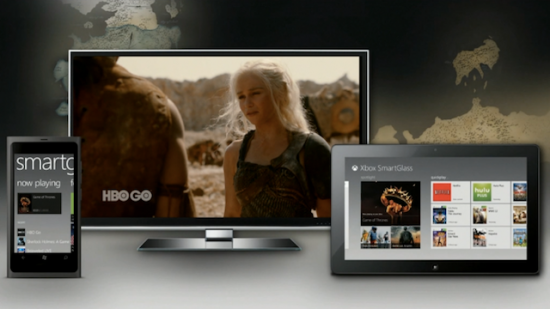 SmartGlass will be the glue that binds all your devices to your Xbox 360, making it an advanced media hub. On the gaming side, your mobile devices morph into extra controllers when you play video games on the 360. Part of the SmartGlass demonstration at E3 was using a tablet to act as kind of a playbook when playing Madden. Outside of the realm of video games, your tablet and/or smartphone could become mediums for metadata content like, as was demoed at E3, maps for Game of Thrones or cast biographies for School of Rock. While this is great for media like video games and movies, the details are far and few between out there for how it could play out on the Internet at large. Mentioned at E3 was how a mobile device would become a traditional keyboard and mouse for navigating Internet Explorer from your Xbox using your TV as a screen. This is neat, but a little uninspired. What is more exciting is what this new way of interfacing could mean further on. Imagine you are on a site: For the most part your tablet or phone would be a mouse until you clicked into a field. At that point the interface on the device would change to a keyboard. That’s all fairly elementary cool, but what if you could alter the way a user interfaces beyond the mouse+keyboard skeuomorphic? Drawing apps, html5 games, basically anything the UI designer can imagine can be accomplished and tailored to an individual website experience. The problem with this, of course, is the chaos of the near limitless ways a person could interface with websites. If you thought the ever dizzying array of display resolutions was a headache, imagine the growing pains of establishing best practices for the multitude of ways to interact with a site that could crop up. So ,while not explicitly for the web development or web design fields, this news from E3 is exciting to us nonetheless. Keep your eyes open a few years down the line on SmartGlass because, if it takes off like I think it will, it’s going to be a very interesting time for user interfaces.